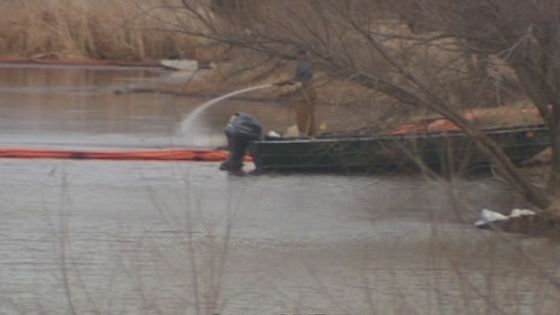 Cleanup is underway after an oil pipline spilled 2,000 barrels of oil into a pond in Oklahoma. A cleanup is underway after a broken pipeline spilled 2,000 barrels of oil into a pond near a Yukon, Oklahoma, neighborhood. Oil began flowing into the pond about 3:35 a.m. Sunday near a neighborhood in the central Oklahoma city 17 miles west of Oklahoma City, officials said. Oil was bubbling up from under the water in a 7-acre pond after being released from a broken 16-inch pipeline, operated by Centurion Pipeline L.P.
A heavy amount of oil was observed on the surface of the pond before pipeline workers shut off the flow of oil, officials said. Fire officials in Yukon say they have received multiple calls from nearby homeowners complaining about a foul smell created by the oil spill. No evacuations have been ordered. Environmental Protection Agency (EPA) on-scene coordinator Mike McAteer said workers are skimming oil off the surface of the pond. Crews will tunnel beneath the pond to inspect the ruptured pipeline and prevent further releases, McAteer said. McAteer said cleanup efforts have been slowed by rain and sub-freezing temperatures that have made travel in the area treacherous. A spokesman for Centurion didn’t immediately return a phone call seeking comment.